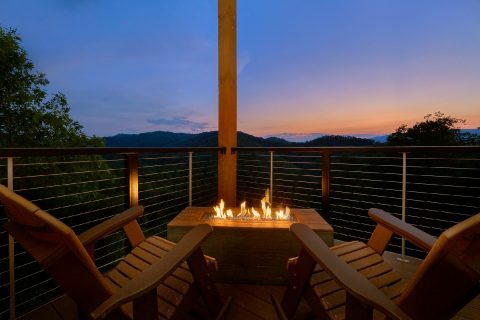 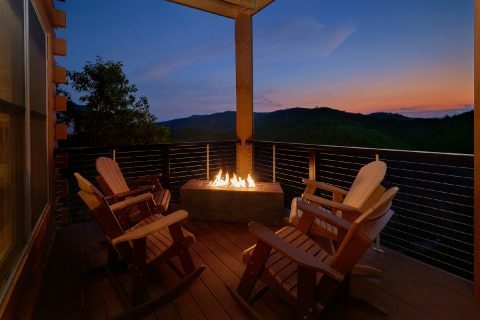 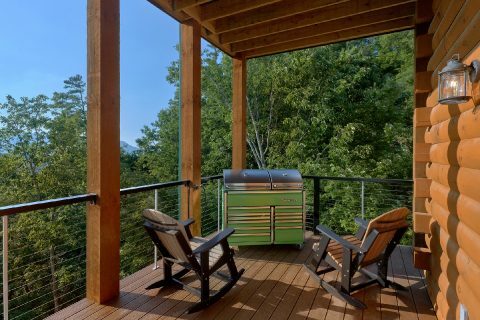 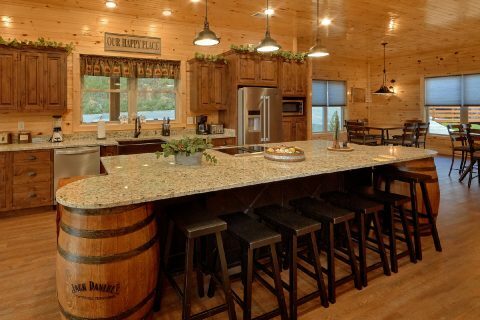 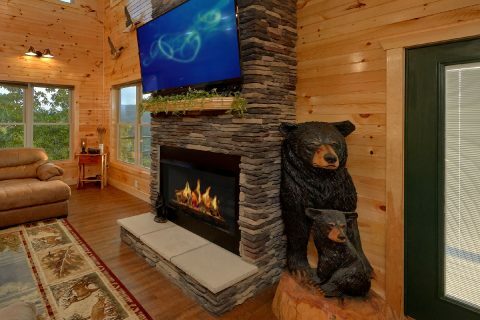 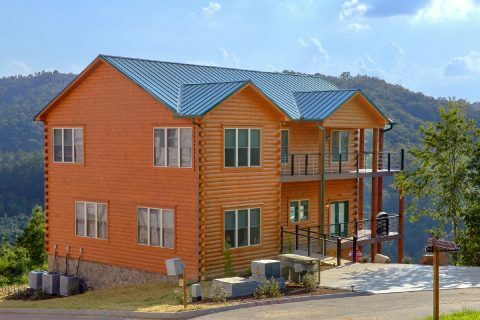 Looking for a luxurious cabin for an unforgettable group vacation in the Smoky Mountains? 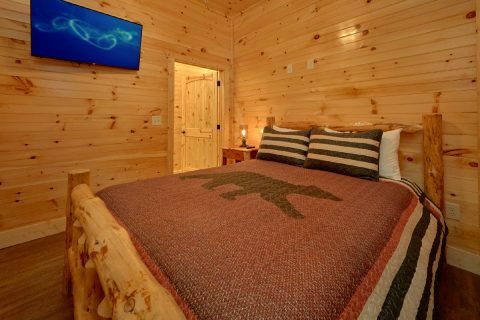 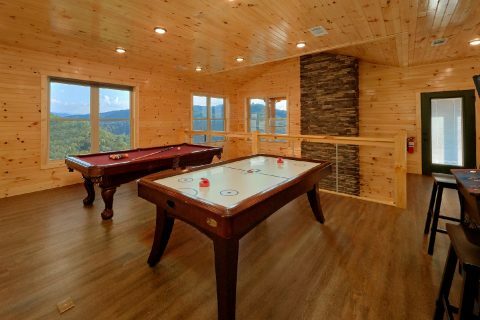 Check out "Mountain View Pool Lodge," a beautiful group cabin that sleeps 25 guests and boasts impressive amenities like a private indoor swimming pool, an outdoor resort swimming pool, a theater room, hot tub, and a game room. 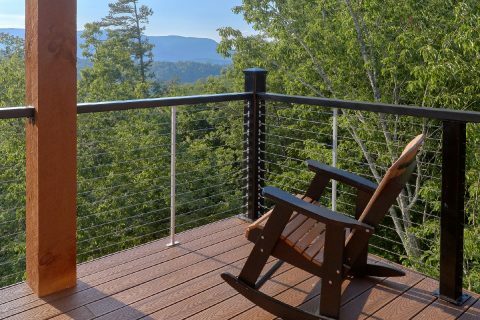 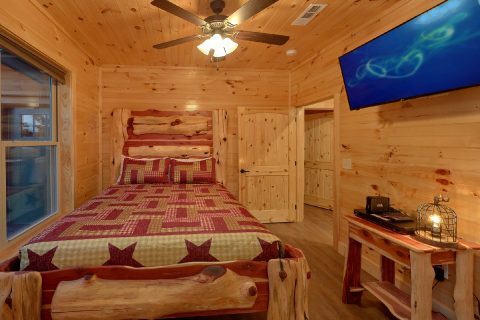 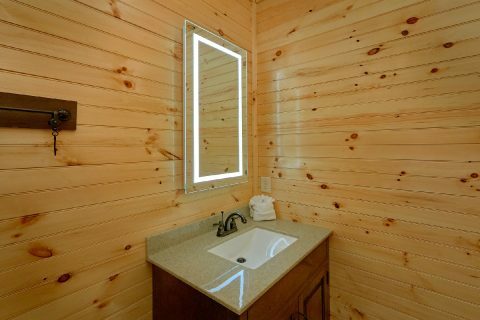 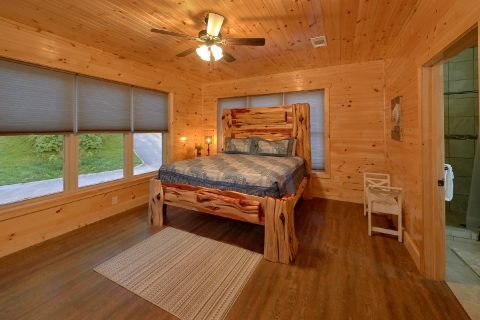 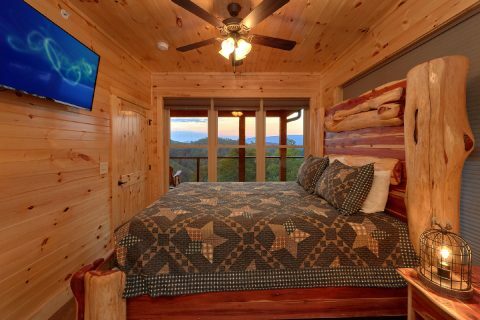 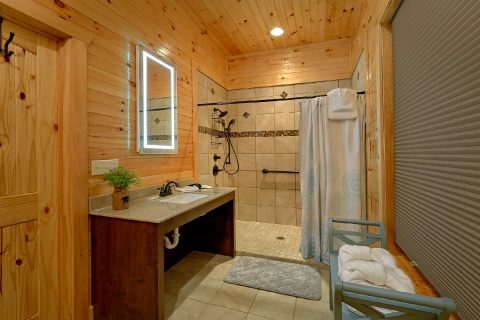 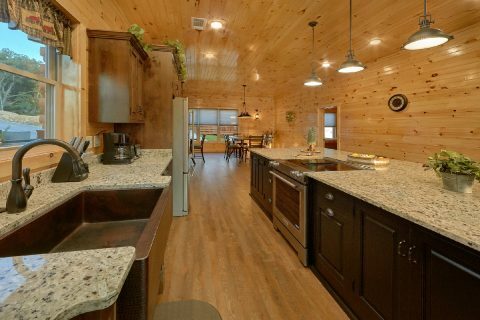 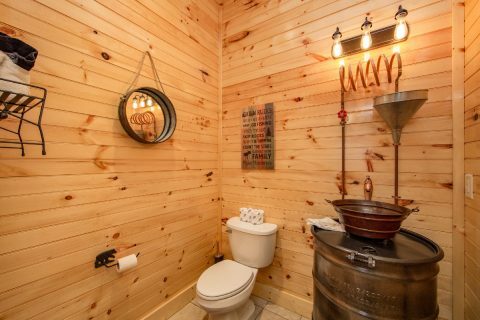 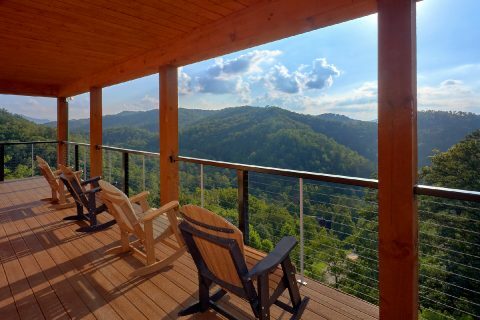 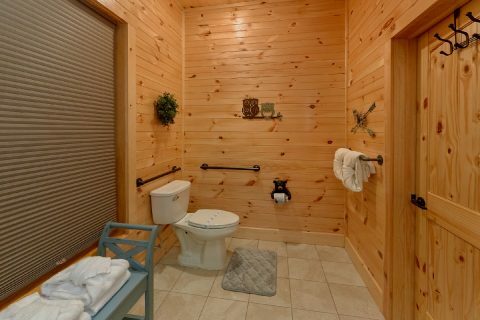 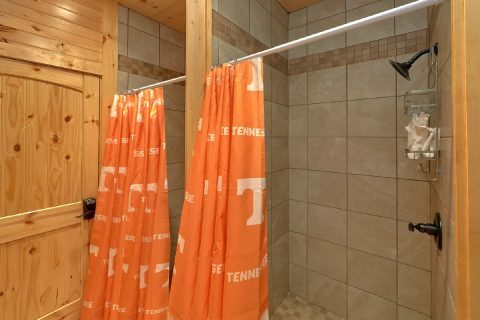 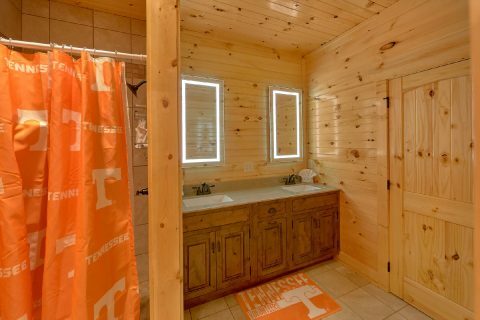 From this cabin's beautiful location in the Smoky Mountain Ridge Resort area between Pigeon Forge and Wears Valley, guests can enjoy quick access to attractions like Dollywood and the natural wonders of the Great Smoky Mountains National Park. 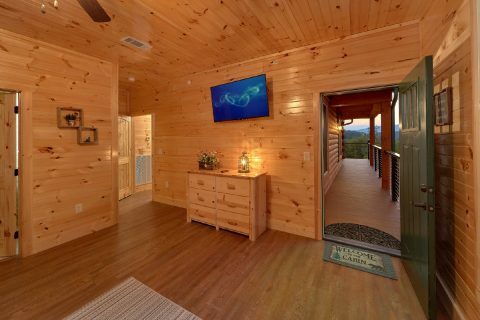 In particular, this cabin is close to the Wears Valley national park entrance, which is ideal for reaching the Cades Cove, Elkmont, and Tremont regions of the park. 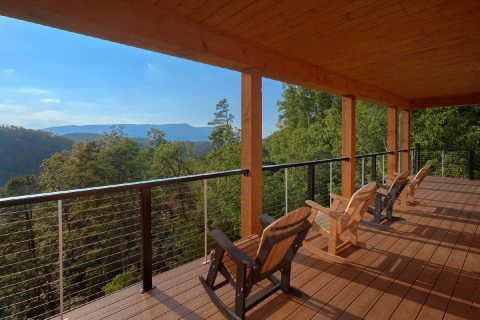 Back at this impressive mountain lodge, you can enjoy a beautiful mountain view from the deck. 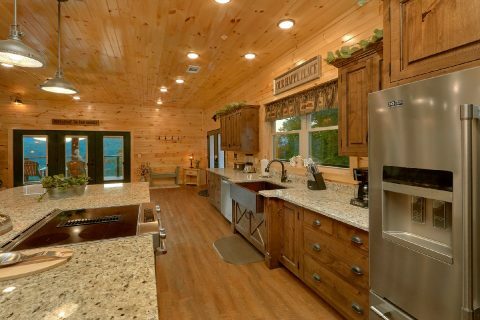 This cabin also provides an outdoor fire pit, but you can also enjoy spending quality time with friends and family indoors. 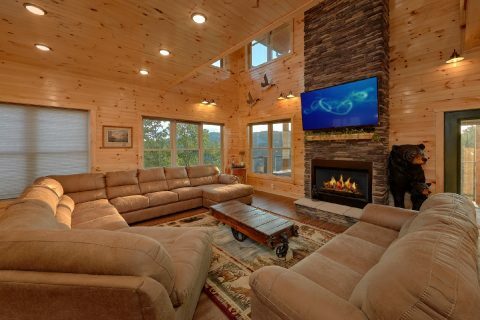 The inviting main living area boasts a gas fireplace, television, and comfortable furnishing for relaxing at the end of the day. 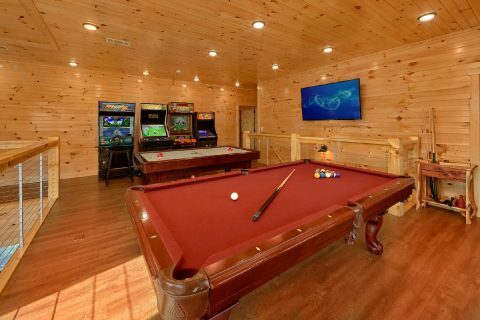 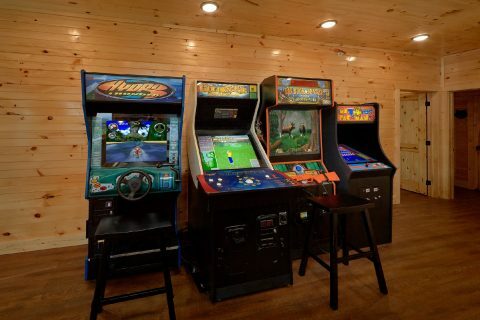 Upstairs, the game room loft provides a pool table, air hockey table, and arcade game. 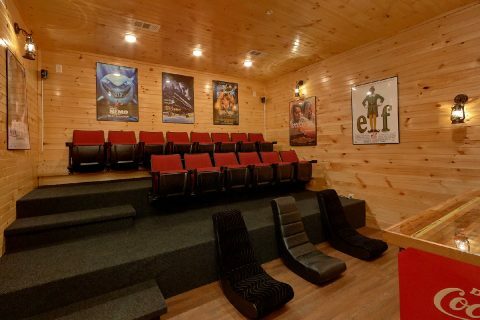 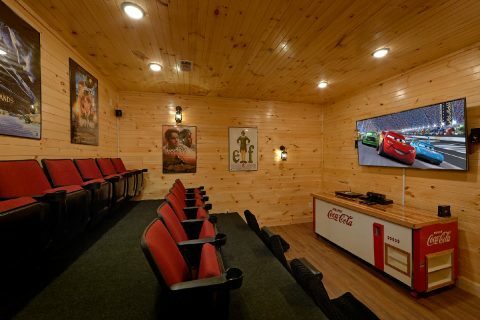 Downstairs, you'll find a theater room where you can watch your favorite movies. 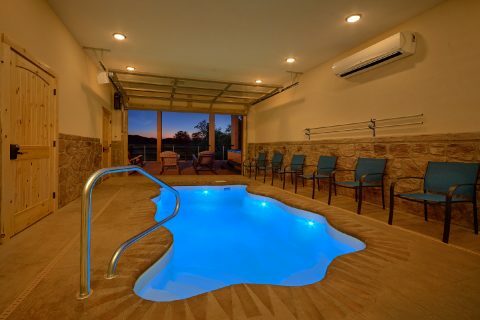 There's even a private indoor swimming pool where you can enjoy a nice swim no matter the season! 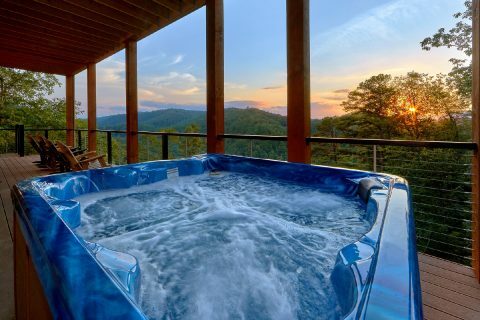 For even more relaxation, you can always rest your weary bones in the warm waters of your cabin's outdoor, 7-person hot tub. 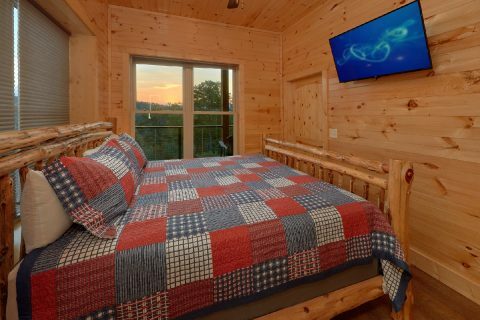 Once you're ready to get some sleep before your next day's adventure, you can look forward to staying in one of this cabin's 8 bedrooms. 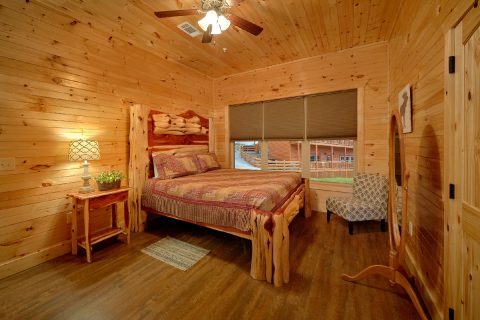 The main level houses a king-size bedroom with a private bath. 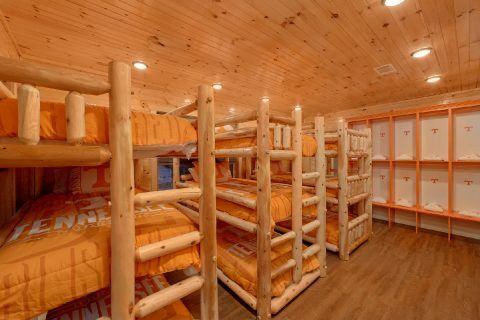 Upstairs, you'll find a king bedroom with a private bath, 2 queen bedrooms with a shared bath, and 1 bedroom with 3 sets of triple bunk beds. 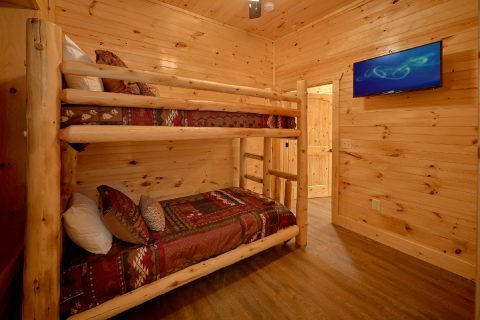 On the lower level of this cabin, there's a king bedroom, a queen bedroom, and a bedroom with a twin bunk bed. 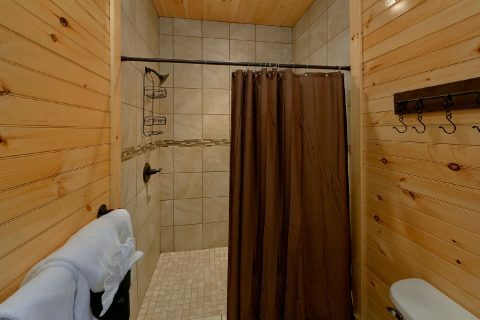 Each of these rooms has access to a private bathroom. 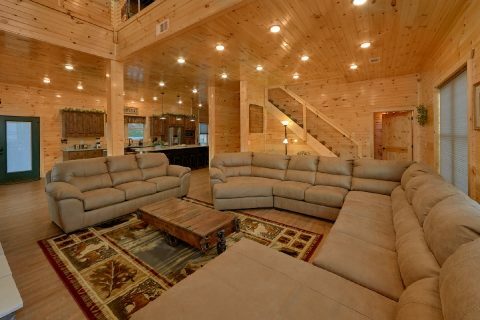 With a sleeper sofa in the living room, "Mountain View Pool Lodge" can sleep 25 vacationers comfortably. 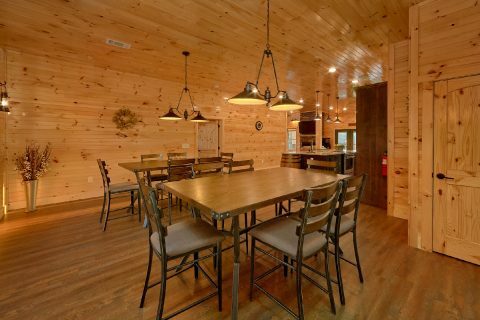 Lastly, this rental also provides practical amenities like a washer/dryer, a gas grill, and a full kitchen for preparing delicious dinners for your group. 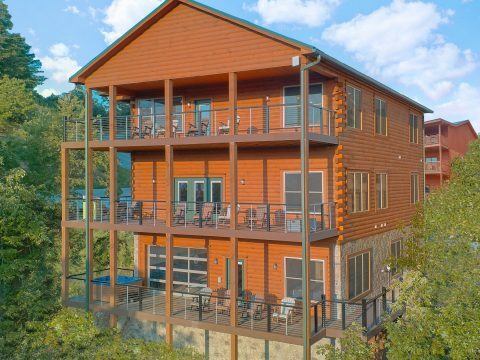 Book this impressive luxury lodge today with Cabins USA Gatlinburg and you'll save 15% on your nightly rate with our cabin discount!